‘Yes, pleased to meet you.’ He shook her hand. ‘Oh goodness, I’m so sorry to have taken up your time.’ She blushed. 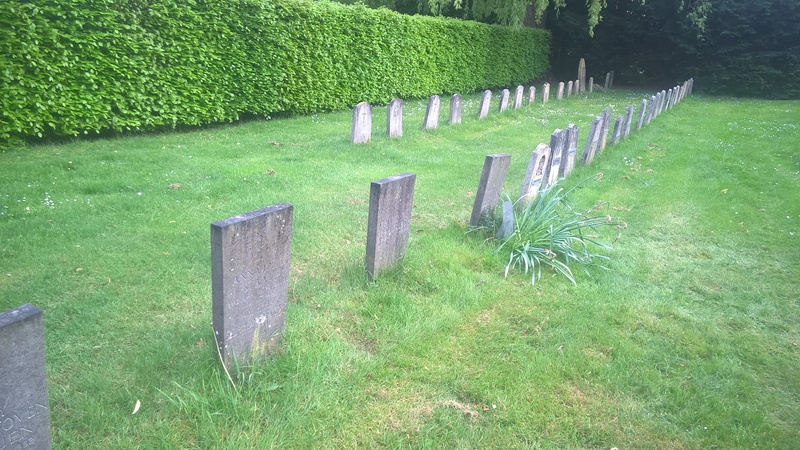 Once around the hedge, Sophie saw the short line-and-a-half of plain, old, grey cement headstones. ‘We never knew she was Protestant,’ she blurted. 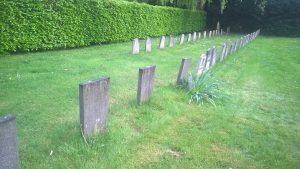 ‘When we searched the main cemetery ten days ago, we didn’t notice the gap in the tall hedge, either.’ Her heart began pounding as she noticed most headstones were nameless – like the many rows she’d searched in the Catholic section. Sophie stepped closer, tried to smile and reply, but tears caught her, choked her. Her hand went to her mouth as she turned away. He moved a discreet distance away. Kneeling on the grave, Sophie appreciated him giving her privacy as she fought back the tears. ‘I never imagined that I’d be so overcome,’ she thought, trying to compose herself. ‘Tonight, I would’ve found Oma’s grave without even looking at the map.’ Sophie looked around. It was the only grave with flowers planted on it. She caressed the daffodil, sprouting strongly beside a piece of tin with MOEDER etched across the top of two columns. ‘The daffodils would have been lovely in full bloom a few weeks ago.’ The flowers and home-made plaque in the warm summer evening made her feel at peace. Indents punched in the metal formed the letters of the names. On the left column they indicated Alida’s eldest child, Nico, then below the two oldest girls, Therese and Emmanuelle. Down the right, in order of age. Marie, Aggie and Ans. Sophie leaned forward on the fine, soft, mown lawn and brushed aside some leaves to reveal the last name.